Indigenous world views are centered on relationships and their value – relationships which connect us with ourselves, each other, our environment, and our Creator. It is through our interactions with one another that we are able to form good relations and share valuable life teachings. Elders have always held a positions of high esteem and importance; they are the living libraries that hold the wisdom, history and cultural knowledge of our Nations. Indigenous Education is stronger at Red River College with the support of our Elders and Knowledge Keepers and through partnerships with the broader Indigenous community. Our Elders-in-Residence are here to support education through Indigenous ways of teaching, learning and leading. They play an important role in student and staff health, wellness, and cultural and spiritual development. They are here to support all students and staff at Red River College. Located in the Indigenous Student Support Centres at the Notre Dame and Exchange District Campuses, Elders-in-Residence offer cultural teaching sessions, one-on-one appointments, classroom visits and lead ceremonies. Mae Louise Campbell is an Ojibway Métis Elder. She has gained respect within the Indigenous and Non-Indigenous community as an elder with a warm generous heart, a vision of healing for the people and a sense of humor that makes all feel at home and welcome. Mae Louise has traveled across Canada sharing traditional Indigenous teachings. She has sat on many boards, been the guest speaker at numerous organizational and political meetings, and led thousands of sharing/healing circles. She has more recently been appointed to Winnipeg’s Indigenous Advisory Circle by Mayor Brian Bowman. Her commitment to help people is evident in the number of calls she receives each week for this work. Mae Louise lives in the heart of Winnipeg where she is the keeper of Grandmother Moon Lodge. The lodge was created for the healing of women, built totally by women for women, without any government funding. She, along with her family offer various programs such as drum making and talking stick workshops for organizations, agencies and groups of individuals who are in need of spiritual healing and growth. Jules Lavallee was born in St. Laurent, Manitoba. He was raised in a Métis lifestyle of fishing, hunting and trapping. His family taught him a rich and beautiful way of Métis life and how everything has to do with the culture (language, foods and customs). He received teachings from many elders from different nations including Dakota (Sioux), Cree, Ojibway, and others. Jules has dedicated the last thirty years to earning traditional practices via ceremony and in healing, teaching or sharing circles. As an educator, Jules has been implementing those wisdoms, knowledges and insights in The Red Willow Lodge that Jules, along with his family, ran for years; and teaching courses via the University of Manitoba along with the numerous workshops, programs and sessions he continues to conduct. Jules is a pipe carrier, sweat-lodge conductor, and has been one of the Elders-in-Residence at Red River College since 2004. 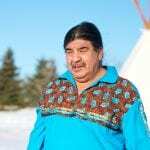 Paul Guimond is part of the Turtle Clan and his spirit name is Okonace (Little Eagle Bone). He and his wife Kim have three children, 16 grandchildren and four great-grandchildren. Paul is a Sundance Bundle Carrier (Chief), Sweat Lodge Bundle Carrier (Water drum) and Dark Room Bundle Carrier. He studied Counselling Skills at the University of Manitoba. In Sagkeeng, Paul sat on Chief & Council for 20 years and served as the School Board Chairman for ten years. He is an active elder with Addictions Foundation of Manitoba and Sagkeeng Child & Family Services, offering healing, spiritual growth and personal development through ceremony, programming and establishing healthy relationships. Paul is also a certified coach in hockey, baseball and lacrosse. Paul joined the Elder-in-Residence Program at Red River College in 2018. As part of our national journey with Reconciliation, we encourage all our Red River College Community to learn more about the role of our Elders and to connect with them. If you would like to meet with an Elder or discuss requesting an Elder for a teaching, sharing or healing circle, or learn more about how time with an Elder can help support your curricular outcomes, please contact the Elder Liaison at ccalder@rrc.ca or 204-623-2103.